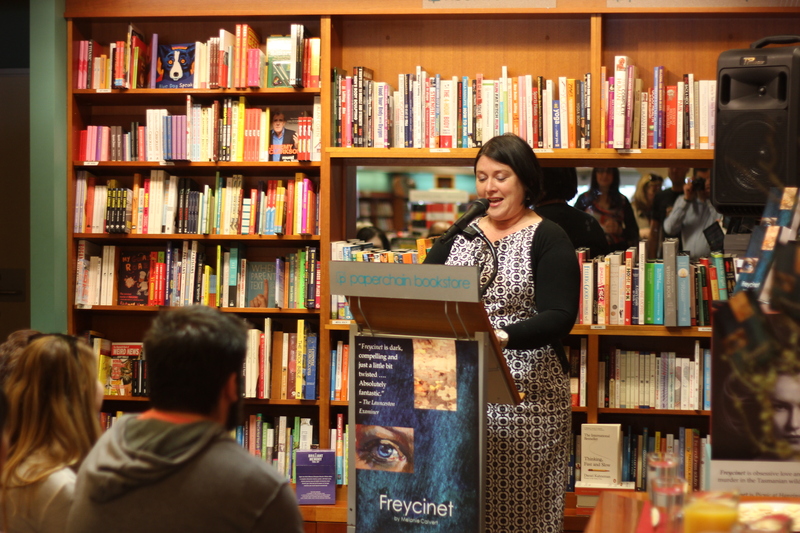 Monica Penders, Film Producer and the Director of ScreenACT, very kindly agreed to launch Freycinet at the Canberra Launch at Paperchain Bookstore, Manuka, 15 Sept 2012. This is a transcript of her great speech! Melanie contacted me a few weeks ago and said she needed someone fabulous, famous and female to launch her book. Well I am female! The rest – sorry – I am all she could find. And therefore I am most honoured that Mel asked me to speak today on this special occasion. As a fellow writer, Mel of books, me mainly of screenplays, I know that the hardest thing about writing is … writing. It’s carving out the time, it’s making that regular concerted effort, it’s ignoring everything else (no – the sock drawer does not need reorganising, or the contents of the fridge need to be put into alphabetic order). This is when the support of the family is vital. And Brad and the kids have obviously helped Mel in every way to get this book written. Everything has to be put aside to satisfy the muse. One of the hardest things about writing or any artistic endeavour is putting it out there – opening up your hard work and often your heart and soul to an audience – hoping for praise and dreading criticism. It was with a little trepidation that I started to read Freycinet (thank goodness Mel put a phonetic pronunciation on the back or I would have embarrassed myself talking about Frixenay). What if I didn’t like it? What would I get up and say here today? That should have been the least of my worries. I should set the scene a little. I recently moved from a small, modern one bedroom apartment in the middle of Belconnen with about 1000 neighbours in the complex, to a 3 bedroom 1950’s fibro cottage in the middle of 1600 acres near the NSW border. Two neighbours in near distance and many rabbits, foxes, wombats, spiders and snakes for company. The cottage has an amazing and sometimes imposing view of the Brindabellas, a copse of trees behind the cottage that my lovely partner, incidentally a Tasmanian, refers to as the Blair Witch trees. I had a night on my own and I thought, I will start reading the book. The feeling of disquiet, of menace, of impending doom and disaster, of events being out of control and predestined that seeped from the first few pages, coupled with the wind playing havoc with the Blair Witch trees and odd sounds emanating from outside, had me putting the book down fairly quickly and burrowing under the covers. This happened a few times, each time going a little further into the story and once actually shouting out – for goodness sake Ginny – pack your bloody bags and get the hell out of dodge! Everything told through the eyes of Ginny the somewhat unreliable narrator, her fears and foibles often giving us the wrong impression. Julian, a man you just wanted to slap! What had happened to him to change him so much and be so emotionally distant on one hand and so pointedly cruel on the other? Why did she stay with him? Run, run, run – straight into the arms of the delicious Tom, who seemed to know her better than anyone even though they had only just met. The ethereally beautiful missing Vivienne, and Ruth who holds the biggest secret of all. The interweaving of the ballet story line with the indigenous folk takes was ingenious and mesmerising, all intertwined with the wild, untamed Tasmanian landscape. Mel has managed to paint a masterfully vivid backdrop to the story. This not only comes from her talent as a writer and all of her impressive tertiary study – but as a painter – the backdrop is as visual as if she has physically painted it as a landscape. As a filmmaker and visual story teller, I can easily imagine this story on the big screen – the vivid colours, the greens of the forest, the blue greys of the stormy sea, the browns of the earth and rotting foliage, the sea green of Vivienne’s dress, the red of stiletto heels and the drying blood. Ginny’s horrifying visions of the victims that only she can see – great visual motifs mixed through the intoxicating harsh beauty of Freycinet. As a potential film, I would compare this as to the classic Picnic at Hanging Rock, The Sixth Sense and even a little bit of Daphne du Maurier’s Rebecca or Mary Stewart’s book Wildfire at Midnight. If only film had smell – because I could almost detect the aroma of cooked quail, of dried blood, of humus rich soil, of decay … and of fear. I so didn’t see the twist coming at the end – and for those who haven’t read it, I won’t give the game away. You have to buy a copy and read it for yourself. A wonderfully well written, evocative and painterly read, a potentially great film. I am going to talk to Mel about collaborating – she should adapt her book into a screenplay and I would love to be involved – and I am going to talk to my colleagues at Screen Tasmania about a co-production at the right time. This entry was posted in Uncategorized and tagged Freycinet, launch, melanie calvert, Monica Penders, novel, Paperchain, Tasmanian Gothic. Bookmark the permalink.